Major Cities of Bolivia. Fun Facts About Bolivia. City Facts and Information. What are the major cities of Bolivia? When we talk about the main cities of a country we’re usually referring to the cities with the largest populations or the cities that are most important for other reasons. It could be because they are capital cities, or very well-known cities, or simply the most visited cities in a specific country. Bolivia has 9 states (which we call departments) and each has a capital city. Therefore, as each is the major city of its state in terms of importance, we’ll tell you about our 9 state capitals first. In terms of population, there are other major cities of Bolivia that are larger than some of our state capitals. Therefore, we’ll list fun facts about the 10 largest cities in Bolivia. There are cities that, regardless of their size, are the most “known” around the world. You'll find information here on the major cities of Bolivia that are most recognized or visited by foreigners. The major cities of Bolivia in terms of being capital cities: Bolivia is divided into 9 states which we call departments. This is the population of each department in 2010. These are population projections. A census was taken in 2012 covering certain sectors of the population. Only one of these cities is the capital of Bolivia. Do you know which? 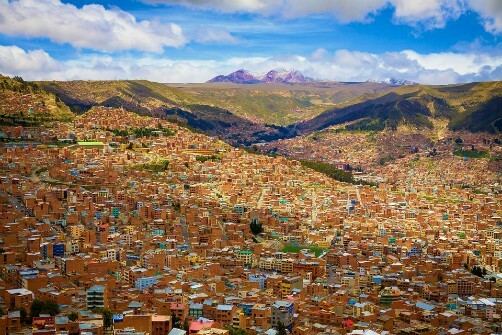 The department of La Paz has 2,839,946 inhabitants. The capital city of La Paz is La Paz. It has 840,209 people. The department of Santa Cruz has 2,785,762 inhabitants. The capital city of Santa Cruz is Santa Cruz de la Sierra. It has 1,841,282 people. The department of Cochabamba has 1,861,924 inhabitants. The department of Potosí has 788,406 inhabitants. The capital city of Potosí is Potosí. It has 167,439 people. The department of Chuquisaca has 650,570 inhabitants. The capital city of Chuquisaca is Sucre. It has 306,754 people. Sucre is also the capital city of Bolivia. The department of Tarija has 522,339 inhabitants. The capital city of Tarija is Tarija. It has 211,018 people. The department of Oruro has 450,814 inhabitants. The capital city of Oruro is Oruro. It has 232,265 people. The department of Pando has 81,160 inhabitants. The capital city of Pando is Cobija. It has 43,323 people. The department of Beni has 445,234 inhabitants. The capital city of Beni is Trinidad. It has 97,625 people.